Classic Osso Buco is a wonderfully delicious dish of veal shanks slow roasted until the meat just melts in your mouth. 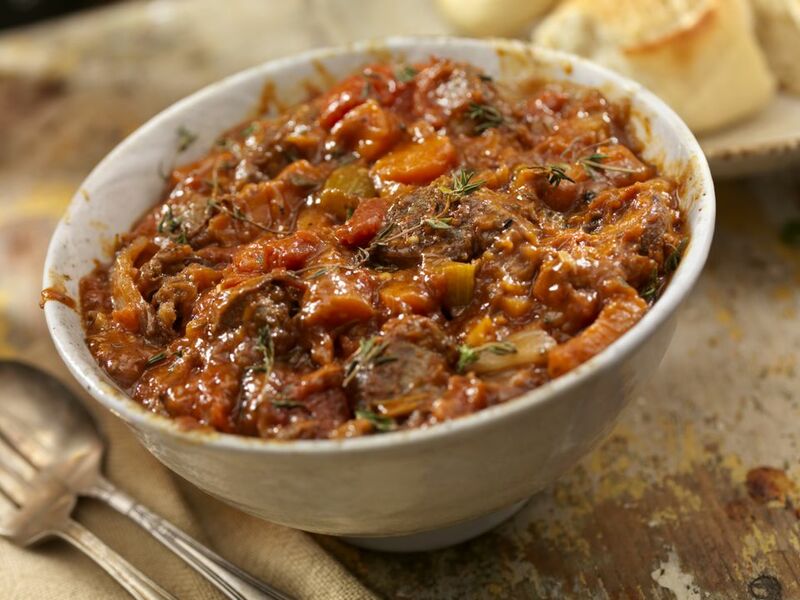 This is a simpler but just as delicious version that uses veal shoulder for a quick recipe that is also less fatty. Osso Buco is Italian for hollow bone which refers to the veal shanks used in the traditional recipe and the marrow in the bone which adds such richness to the dish. This is not true Osso Buco, therefore, but we use a lot of the same ingredients to get that same flavor. White wine and chicken broth are used so as not to overpower the delicate flavor of veal. Heat olive oil in a dutch oven on the cooktop over medium-high heat. Alternatively, you can brown the veal in a cast-iron skillet or heavy-bottomed sauté pan and then transfer everything to an oven-proof dish. In a small bowl or sealable plastic bag, combine the flour, salt, and pepper. Toss veal cubes in flour mixture. Shake off excess flour and add some of the meat to the hot pan without overcrowding. Brown the meat on all sides, then transfer to a bowl. Continue browning the meat in batches until all the veal is cooked. While the meat is cooking, preheat the oven to 300 F.
Add the onion, carrot, and celery to the empty dutch oven or pan and sauté for a couple minutes. While stirring, add the minced garlic and sauté for another minute or until the garlic becomes fragrant. Take the Dutch oven off the heat. If using a pan, transfer the vegetables and garlic into an ovenproof dish. Add the white wine and use a wooden spoon or spatula to scrape up the tasty little bits on the bottom of the pan. Add the oregano, thyme, parsley, plum tomatoes, and chicken broth. Add back the browned veal and stir everything together. Cover, transfer to oven, and braise, stirring every half-hour, until the meat is fork-tender (approximately 1 1/2 hours). If the stew seems too thick, add a bit of water or broth. If the stew is too thin for your liking, remove the cover for 10 to 15 minutes. Remove from oven and stir again to break up in large pieces of meat. Serve in individual bowls or spoon over mashed potatoes or risotto.